For those of you unfamiliar with the name Birbal, here's a quick primer. Stories of the third Moghul Emperor Akbar & his grand vizier Birbal are the stuff of legends, and almost every kid growing up in India will have heard at least one or two of these delightful folktales. Birbal's sense of fairness & justice brought him the undying faith & trust of his Emperor along with jealousy & intrigue from the other courtiers who envied his proximity to Akbar. The Khichdee story illustrates Birbals quiet quick witted way of getting his point across to Akbar. During the Winter season in Delhi, Akbar was strolling along the banks of the Yamuna river, when he noticed how bone chilling cold the water was, and wondered if anyone would dare spend the night standing in the river. When Birbal responded that if the reward was good enough, someone who needed the money would step up. Sure enough, the announcement (and a reward of a 1000 gold coins) was made, and an impoverished priest accepted the challenge. He stood chest high in the chilly waters, watched over by a couple of Akbar's sentries. The next morning, the priest went to the court to claim his reward. But, just as Akbar was about to hand the bag of coins to him, a jealous courtier interjected and asked the priest how he achieved this feat. The naive priest responded that he kept his gaze focused on the palace lights in the horizon and this kept him motivated. The courtier then claimed that the priest had derived warmth from the palace lights & hence was not eligible to claim the reward. Akbar reluctantly demurred to this, while Birbal resolved to find a way to give the poor man his rightful due. A few days later Birbal invited the Emperor & the other courtiers for a feast at his home. Since Birbal's table was reputed for its excellent gastronomical fare, especially his khichdee, everyone eagerly accepted & arrived at the appointed hour.. They waited,.. and waited, ... and waited. Finally, Akbar, losing his patience, demanded to know where the food was. Birbal politely led him to the backyard where there was a huge roaring fire and a pot of khichdee ... suspended about 6 feet above the flames. When the enraged courtiers demanded to know how the dish would heat up enough to cook, Birbal quietly replied, " The same way that poor man got his warmth while standing in the river all night". Needless to say, the man got his reward the very next day. The take home message about the dish.. It needs a lot of love & time to cook to perfection. A Khichdee is typically a dish that is quickly cobbled with rice, lentils (typically mung) & whatever vegetables are on hand. 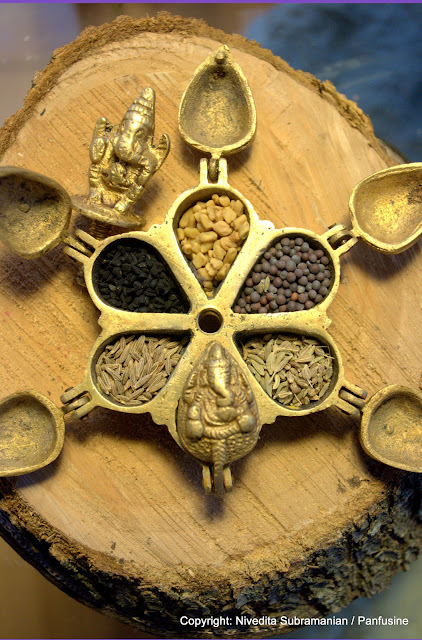 Down in the southern states, its called a Pongal (boil over), & is typically seasoned with a tempering of cumin, crushed peppercorn & curry leaves. The difference in taste is primarily in the temperings that are used to season the rice/lentil mix and this varies from area to area. I'm still in the process of recovering from the sheer delight of reading Chef Suvir Saran's latest book 'Masala Farm'. As is my style, I'll finish the book and promptly go back to the beginning..a couple of times. It'll take some time for me to get objective enough to post a review, but in the meantime, I've already zeroed in a number of vegetarian recipes that I crave to make & relish. The first one in the list was the 'Birbal kee Kichdee' (which I can now officially 'check' off ). Cumin, Nigella, Fenugreek, Mustard and Fennel mixed in equal proportion. 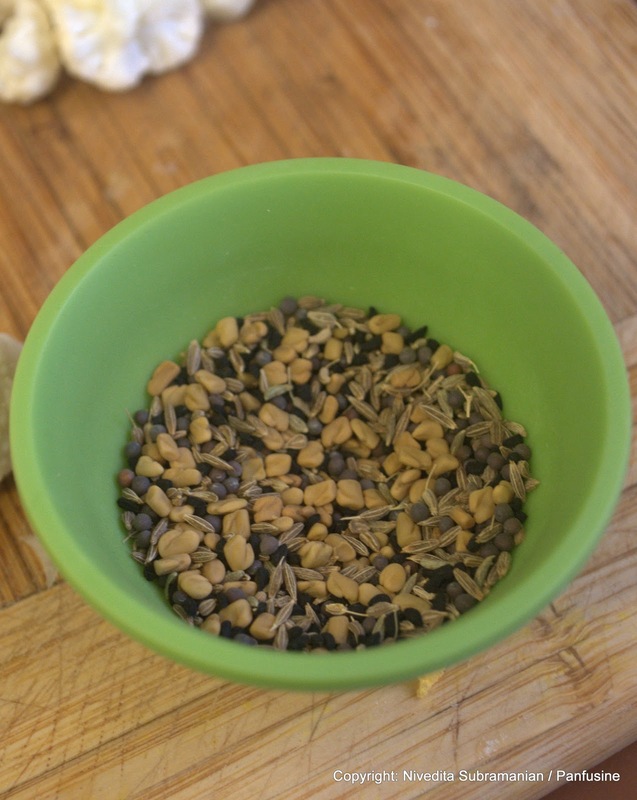 To make Panch Phoran: Combine 1 teaspoon each of Cumin, Nigella, Fenugreek, Mustard and Fennel seeds. Toast the mung dal over medium heat until its fragrant and turns a golden brown. Set aside. In a heavy bottomed pan (or the pan of a traditional Indian pressure cooker), heat the ghee and add the cardamom, cloves, bay leaves, cinnamon, panch phoran. Fry until the spices are fragrant and then add the turmeric and asafetida. 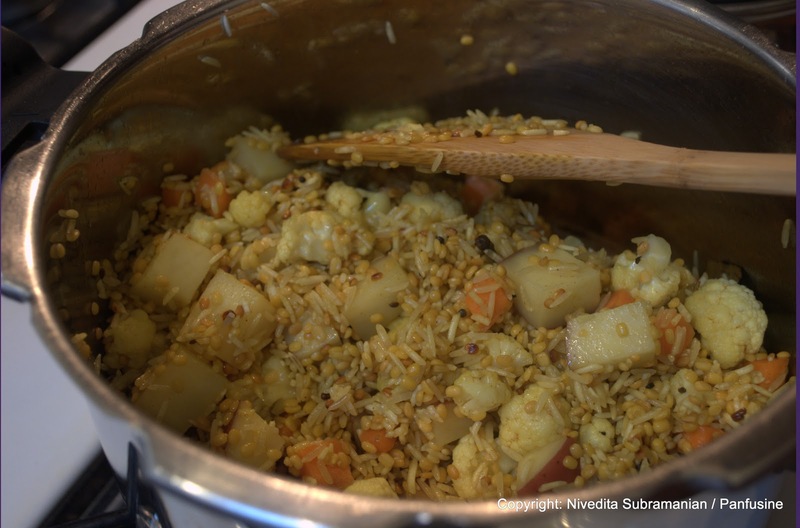 Add the rice, toasted dal, cauliflower, potato and carrots and stir until the rice turns translucent and the cauliflower just begins to soften. Add 7 cups of water and bring to a boil. Add the frozen peas, reduce heat, cover and cook for about 20 min (If using a pressure cooker, shut the pan with the lid, fit the weight and allow for 2 - 3 whistles.). Once the rice & dal have cooked, mash the mixture to a semi smooth consistency (as per your preference), using a potato masher. In a large skillet, heat the ghee and add the panch phoran. when the cumin begins to brown, add the salt & onion and cook till the onion just begins to brown. Add the coriander, stir in, and then add the tomatoes along with the cayenne powder. Cook down on a medium low flame until the tomatoes are cooked to a 'jammy' consistency. Remove from heat and add this mixture to the rice/dal blend. Add the remaining 3 cups of water and bring to a boil, simmering for about 2 more minutes. Remove from heat. Your basic khichdee is ready. In a skillet, heat the ghee for the tempering, add the cumin seeds until they sputter and then add the cayenne powder & asafetida. Stir in this sizzling mix into the khichdee. 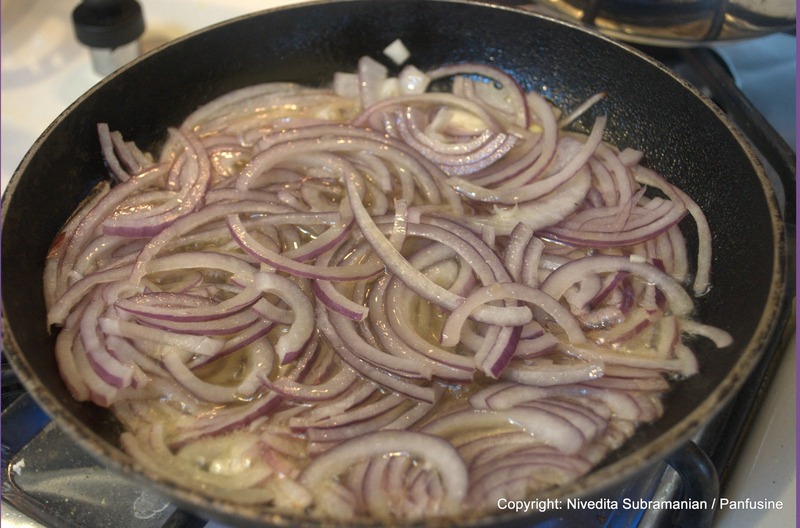 Heat the oil, add the sliced onion, and cook down until the onion caramelizes almost to a crisp. Transfer the onion onto paper towels to absorb excess oil. Combine the cilantro, ginger, chili & lime juice into a relish. Dish out generous dollops of the Khichdee into serving bowls. Garnish with the cilantro, ginger & lime relish & top with caramelized onions. Add a pinch of garam masala to the dish just prior to serving. Serve with a toasted lentil papad. Hi Nivedita...clicked in here from Fb where Apolina shared this post. 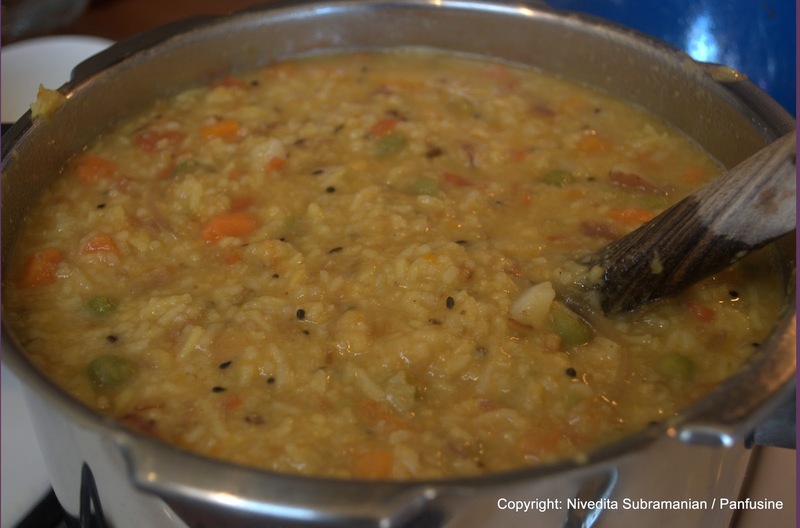 Khichdi is my all time fave comfort food and your post made me crave for it. 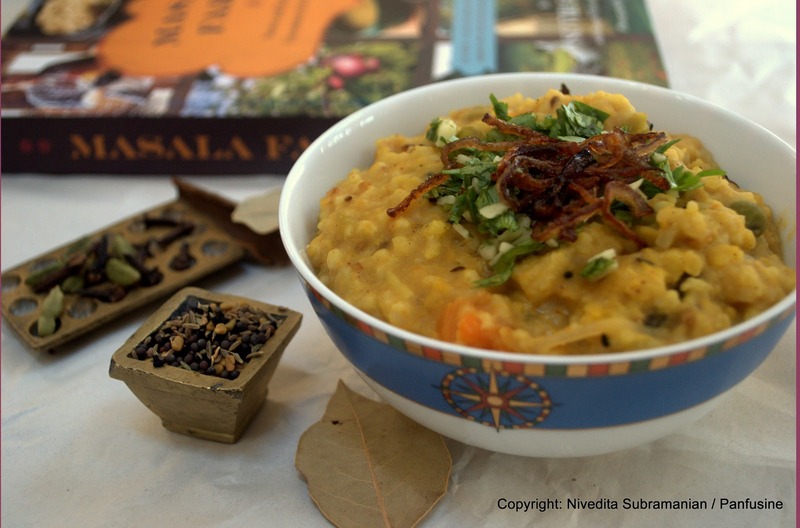 Liked to reread the story of birbal ki khichdi which my grandfather used to tell us....Loving all the flavors in this khichdi. Thanks Sangeeta! Suvir Saran's recipe is a definite Keeper. I'm almost tempted to make it again today! Came over from FB. Glad I did. Lovely khichidi. Beautiful pictures, thank you! Do you think a fairly new novice could make this? 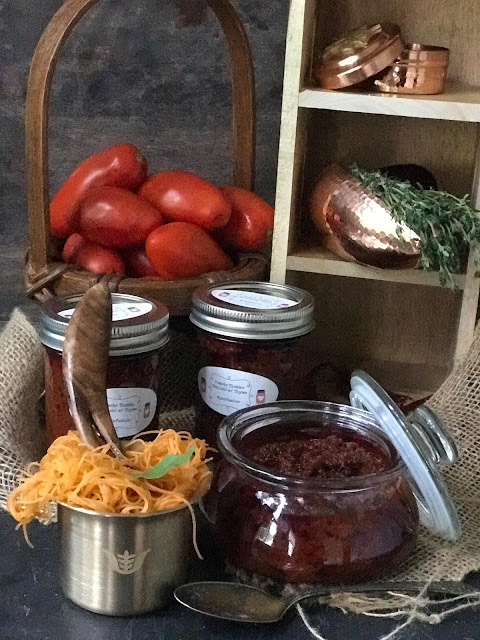 It looks so warm and comforting and flavorful--I have Masala Farm, and everything I need except for nigella seeds--I don't know what those are. A trip to the Indian store! Hi Ellen, I absolutely think you could.. its just a longer process, but well worth the effort. 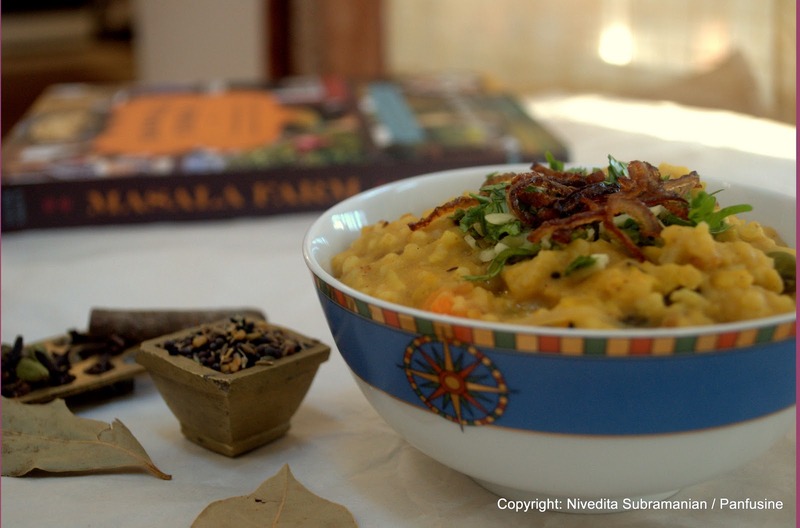 You cna find Nigella seeds in Indian grocery stores under the name 'kalonji' You'll absolutely love this comfort dish! thank you, Niv! I'll let you know how it turns out! LOL Bhuvaneshwari.. Thats actually a 'kumkuma choppu', the photograph makes it look bigger than it is! Picked it up from Mother Earth store in Bangalore!